Greetings all; do any of you lovely Morbid Anatomy readers out there happen to have a high-resolution version of the above image, or know a book that contains it, or another way I might source it? Please send any suggestions to morbidanatomy@gmail.com. Thanks so much! THE DANCE OF DEATH. 1919. 54 1/2x41 inches, 138 1/2x104 cm. Condition B+: restoration along vertical and horizontal folds; minor restoration in margins. Fenneker designed over three hundred movie posters. His recognizable style drew largely on German Expressionism combined with a flair of aesthetic decadence. 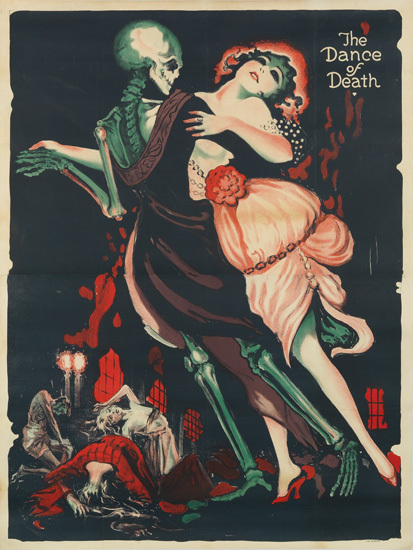 Written by Fritz Lang, Totentanz is considered by The Internet Movie Database to be a "lost film [in which] a beautiful dancer's sexual allure is used by an evil cripple to entice men to their deaths. Falling in love with one of the potential victims, she is told by the cripple that he will set her free if her lover, actually a murderer himself, survives and escapes a bizarre labyrinthe which runs beneath the cripple's house" (www.imdb.com). Even without a signature, this poster is clearly the work of Fenneker. Although another image by Fenneker for this film exists, this particular version is previously unrecorded.